Better late than never when the hike was as good as this one! Sunday morning, my car-ful of dogs found its way to the base of Ravine Road in Benton where we met up with Linda, Dan with Molly, and Hannah with Lilo. Eva danced around, excited and scared at the same time (she's a timid chica with new people). Once we got underway, she was prancing. That was at 8:45 and it was barely cool enough for gloves. Gloves I quickly lost and had to turn around for. That was loss #1 of the day. We passed the lodge and the end of the road where the actual trail system begins. I don't have many photos but they're extremely well marked. We opted to head up via Gorge Brook and return via Carriage Road and Snapper. The trail was a little rocky but moderate in grade, following the water for a ways before reaching the Gorge Brook/Snapper junction. When we turned right onto Gorge Brook, the trail became (even) easier (sounds backwards, right?!) as the woods thickened and the rocks became less existent. The trail curved left, the rocks returned, and it became slightly steeper (still moderate by comparison to, say, the A-Z Trail as one approaches the ridge). Soon there was enough ice between the rocks that we donned our microspikes. Between then and treeline, we leapfrogged with a group that wasn't sporting traction and, with their trekking poles, fared well. A few winding switchbacks that I hardly noticed as such maintained the moderate grade that we'd been enjoying. There were a couple of vistas along the way and as the trail turned ledgy-er and the trees got scrub-ier, I knew the treeline was not far. Between then and treeline, the trail wandered much like many ridge walks do - icy at the moment, fairly flat, and quite enjoyable! I took my micros off too early. Still doable! The views and our tolerance for the wind solidified my goal to hit some higher peaks this winter. Heading down, the wind died off almost immediately as low tree cover became available and we used the opportunity to put our micros back on. I also got to be part of the doggy huddle (below)! Rime! A very special sight for this novice "winter" hiker. Photo courtesy of Dan S.
We took the 10 minute detour to South Peak and enjoyed its quieter summit and beautiful memorial plaque. The last couple of minutes were a bit steep but I honestly preferred it to our summer ascent since the ice smoothed the rock jumble a bit and required the use of traction that wasn't an option in the summer and made getting a foothold easier. Carriage Trail is a favorite - steady, easy grade and good footing, although micros are most definitely recommended. The ice turned to shallow, slushy snow before completely giving way to dirt and mud. As the trail narrowed, we met two dogs and their humans cruising down, giving Ty the opportunity to slip away for a bit. Loss #2. Like the gloves, the search went on a little longer than I'd expected but all's well that ends well. A little muddy, a little rocky, but an easy descent all in all. Snapper and Ravine Road flew by as we were closing in on dusk and the going was good, we didn't make any more snack breaks and only one wardrobe change (de-layering for the dogs). Lots of (temporarily) sleepy dogs and a handful of happy humans who love Moosilauke! I wish this one wasn't so far for us; Tango did fantastic, even though he is on doxy for some tick borne illnesses and he probably did a full 11 miles once my backtrack for the gloves is factored in. The Moose (via this route) is, in my opinion, one of the easiest 4K's and most enjoyable. It offers decent footing and easy-moderate grades. It's a good introduction to being above treeline and it can definitely get windy but the exposed distance is about a half a mile via this route. The dogs found plenty of running water along the way and dined on snow. 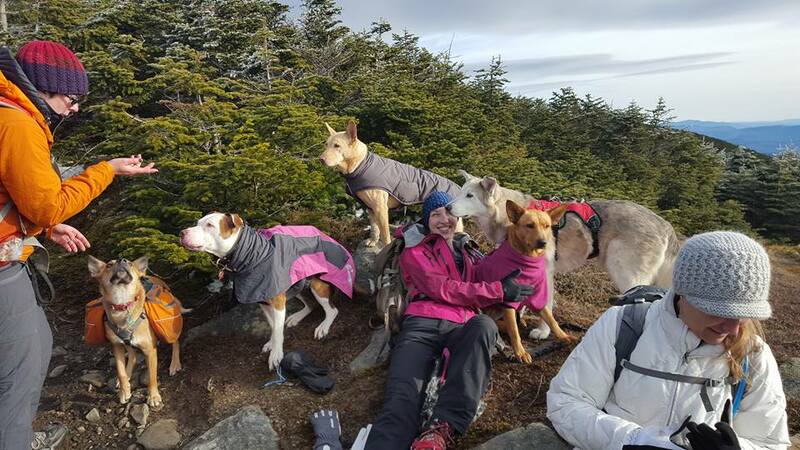 It was a little challenging to find a spot that protected them from the wind at the summit but their coats seemed to help quite a bit; Tango was fine (naturally! ), and Molly (no coat) seemed plenty focused on food to be bothered. On top of it all, we were treated to spectacular views. I know folks who have visited this summit seven times and missed the views. My advice is keep going til you get lucky. The hike is enjoyable regardless and the views are worth coming back for! Sunday's plan did not follow any of the tentative ideas set in place during the week. Passing through Fryeburg, I still didn't know where we were going to go while the clock crept towards noon. At the turn to depart from Rt 113, I opted to turn right and see what the view was like from the visitor center in North Conway and go from there. I had a lot of factors to consider: the expected wind chills, a new foster pup from Texas, some gear to test, and changing forecasts. In the end, we parked at the Kearsarge Trail on Hurricane Road for Kearsarge North. The dingo ladies sang me their impatience song so I prepped as quickly as possible. The pups were all stoked to be there and we got started quickly and in great spirits. I couldn't believe the weather - mid 30's (the whole way up) and gorgeous blue skies. The trail began covered in leaves but rocks were sparse so I wasn't constantly tripping on hidden ankle-twisters. The grade was easy and the dogs continued to be in an extra chipper mood. We passed in and out of pines and the ascent began slowly and easily. Twenty-five minutes in, we were back in the evergreens for awhile and the trail was littered with small rocks but still generally good footing for the Whites. What I loved about this trail was its rolling nature. We would gain some elevation then amble for a bit, making for a really enjoyable hike. If the 4K's were like this, we'd do them all again! About halfway to the summit, there was what seemed like a vernal pool that didn't know we were in late November - bigger than a puddle but by no means a pond. Though not ideal, it was the only decent source of water along the way for the dogs. They found some puddles in the rocks further up as well. After their drink, we kept a brisk pace through another flat section littered with leaves. Gradually, the ground underfoot turned to rock, indicating we were nearing the ledges. (I never thought of broad, flat rock sections as ledges but that term is per the White Mountain Guide.) The ledges gave teaser views of the valley but the trees rose too high to see much. In the winter when the snowpack is high, the views are more complete. For about a half mile we got to enjoy weaving our way up the rocks. This is also where we began to encounter a small amount of ice - occasional thin sheets over the rock faces and frozen puddles. We then re-entered the woods where the trail switched gears to the root and rock-covered type. Special care with footing was required here and there, especially on the way down, but not too bad, especially in comparison with the higher peaks. A Facebook friend shared photos from Cannon where the trail was quite literally a river of ice. There was a small (several step) drop and then steep ascension of 20 or so feet that really threw me and my stepmom off the first time we did this hike last year. Within a few minutes, we took the first of two telltale turns where I knew we're nearing the summit. The first is a right that goes over a boulder (photo below) and the final, left-handed turn is a giveaway we're about to reach the summit ledges. Something about that left is unmistakable - the way the wind hits us on blustery days (every previous visit we've made!) or how the sun shines down at an angle on sunny days. Today the weather gods blessed us with no wind and stellar blue skies. After a snack and some wandering (and some moose poop I'd like to forget), the folks in the tower departed and we scooted up the steep stairs to a miraculously empty, warm fire tower (another two firsts!). We snacked, the girls whined, and I took in the 360* views, from both inside the tower and the narrow porch around the exterior. While I could've stayed forever, knowing I might not ever get an opportunity like that again, the girls were antsy to keep hiking so we headed out. In the distance and in the clouds (center) is Mt Washington. I believe the Doubleheads are the two in the foreground. Not too much to say about the hike down. We cruised, even over the sections with minor amounts of ice. While it took about two hours to reach the summit, it took half that to get back to the car. When Tango wants to jog, you jog! It made me so happy to see him so vibrant and enthusiastic. The total duration of our hike was just under 3.5 hours, as we pulled out at 3:00, exactly 3.5 hours after we started out. trails that go on uniformly for miles wear on me as I wonder where I am in between junctions. The footing is great for the Whites. While I do enjoy a challenge, most of my favorite trails are those that are easiest for Tango and this one is certainly a winner. It was an absolutely perfect first hike for Eva, who rocked it. Two noteworthy comments regarding the pups: the first .3 miles go through a residential area and there is not much in the way of natural water sources. We love the tower at the top, whether it's to escape the wind for a moment or take in the views. Four extremely happy hikers at the end of this one!